Paul Cupka chats with technician Scott Duvall about tire repair issues. Cupka is Fairfax County’s Department of Vehicle Services West Ox Maintenance Facility superintendent. 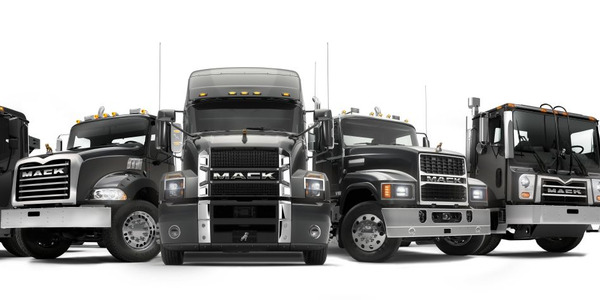 Paul Cupka is alarmed that the trucking industry is behind a looming eight ball when it comes to filling the many vacancies for skilled maintenance technicians. 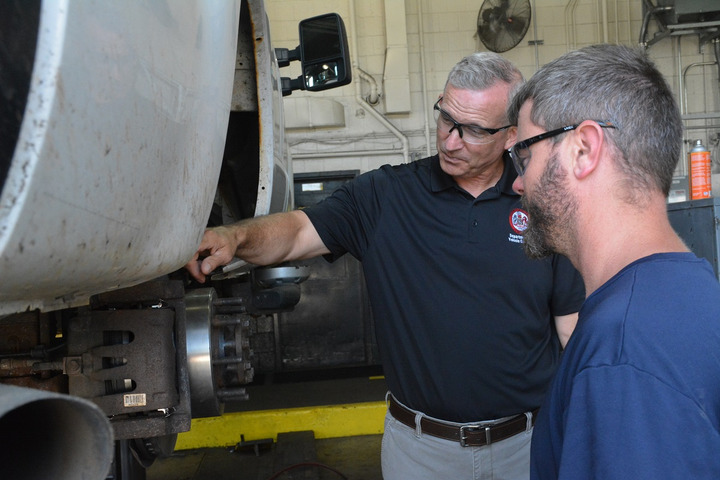 “We’re already behind, but in 10 or 15 years we’re going to be in a lot of trouble,” said the West Ox Maintenance Facility superintendent for Fairfax County’s Department of Vehicle Services in Virginia. Cupka is not waiting for others to take action in his universe. He scouts local vocational schools and actively encourages his 60 technicians and six supervisors to constantly train and stay abreast of rapidly changing technology. Fairfax County’s four maintenance facilities —all of which are ASE Blue Seal Certified —are responsible for 6,000 pieces of equipment. Cupka’s shop works on 1,400 of those vehicles, ranging from school buses and fire pumpers to mowers and rolling sign boards. The four Fairfax County facilities also ranked 15th out of 3,000 in Government Fleet Magazine’s Top 100 government fleets in the country. Cupka taught truck technicians for a year and sits on the board of advisors at the Northern Virginia Community College (NOVA). He also volunteers for outreach to potential technicians at area high schools and welcomes students to his shop as apprentices. "Our industry needs more people like Paul, who get involved and try to make a difference. He’s not sitting on the sidelines and waiting for someone else to do it. 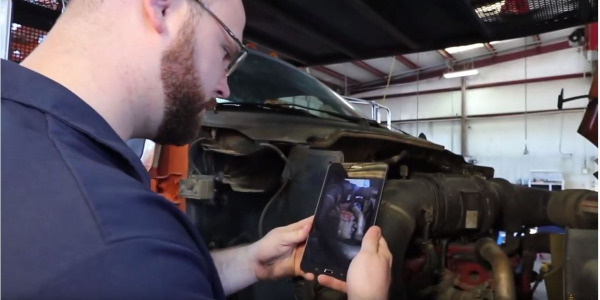 Paul clearly leads by example,” said George Arrants, automotive education consultant, specializing in ASE accreditation and a familiar face around the TMCSuperTech competitions put on by the American Trucking Associations' Technology & Maintenance Council. Cupka, who in his youth began but wasn’t able to complete the NOVA automotive program, took his first job as a mechanic in 1978 for the Washington Post’s Robinson Terminal Warehouse & Trucking Company, a fleet that delivered news print. 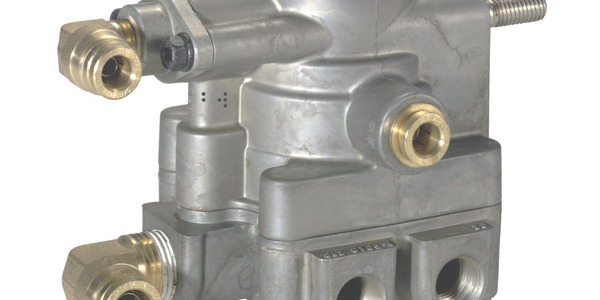 “Then we were known as mechanics or grease monkeys. 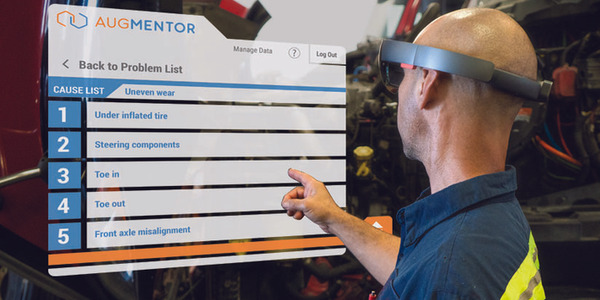 There were no computers,” he said, adding that the current job title of maintenance technician better describes the more advanced systems of today’s working fleets. He labored for 32 years with Robinson before starting with Fairfax County as a technical trainer. After spending four years as supervisor of training, safety and quality assurance with the Fairfax County Government Center, he was promoted to his current position, but training still gets him out of bed each morning. “I realized when I started teaching how satisfying it is. 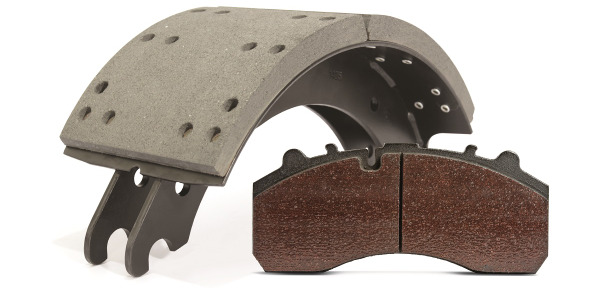 I wasn’t born knowing this, but it’s icing on the cake when after a brake class, a student walks up to me — he’s been a technician for years — and thanks me for taking the time to pass on what I’ve learned. (The attendees) say that if they’d known some of what I covered in the class, it would’ve made their jobs easier,” Cupka said. John Wingard (left) and Paul Cupka at the dynamics station, where they put school buses in gear on a treadmill to test engine functions. 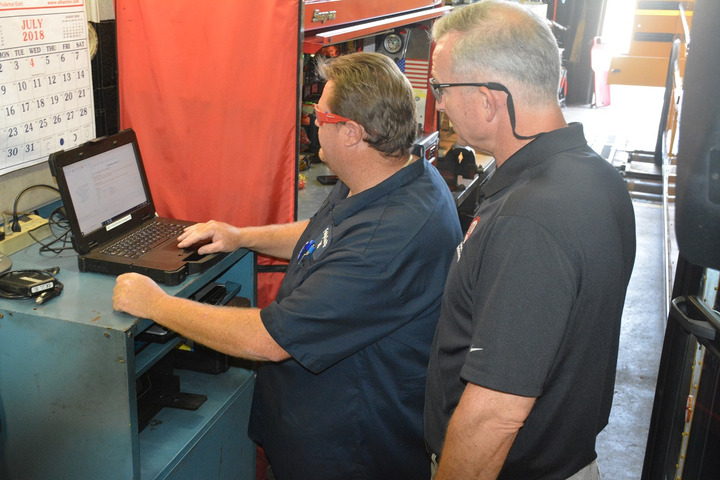 Regular training is held at the West Ox facility by Cupka and others to ensure technicians are familiar with all systems of the vehicles. Cekala, who attended Lincoln Tech in Landover, Maryland, has been a technician for 22 years, but continues to be impressed with Cupka’s level of experience. Iames graduated in 2008 from Universal Technical Institute in Exton, Pennsylvania, and first worked with an international school bus supply company. He completed the five ASE certification tests in a year and a half and aims to be a shop supervisor someday. “Paul has been on the floor, so he understands. When we needed a laptop that hooks up to school buses to diagnose issues, he went before the county and convinced them to purchase the computer,” said Iames. The shop staff do all they can to keep repairs in-house. 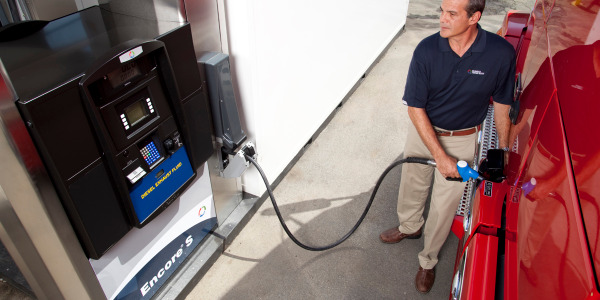 “Our labor rate is cheaper and when we have sent equipment out for repair, we never know when we’ll get it back,” Iames explained. Cupka insists that technicians remain flexible to work on mission critical vehicles – such as fire trucks and medical ambulances. 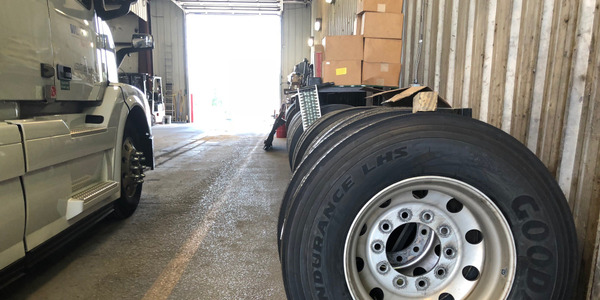 They have to be on call during the weekends and weather emergencies too, but overall he feels working for a government fleet is less stressful than a dealership where there is increased pressure to return a vehicle to service in less time. TMC also benefits from Cupka’s training prowess. For the last four years, he has been one of the trainers for the North American Transportation Management Institute (NATMI) Certified Director/ Supervisor of Maintenance Certification courses. Cupka holds the NATMI director of safety certification. He is also involved with the Educator Committee and the S.3 Engines Study Group, focusing on aftertreatment systems. 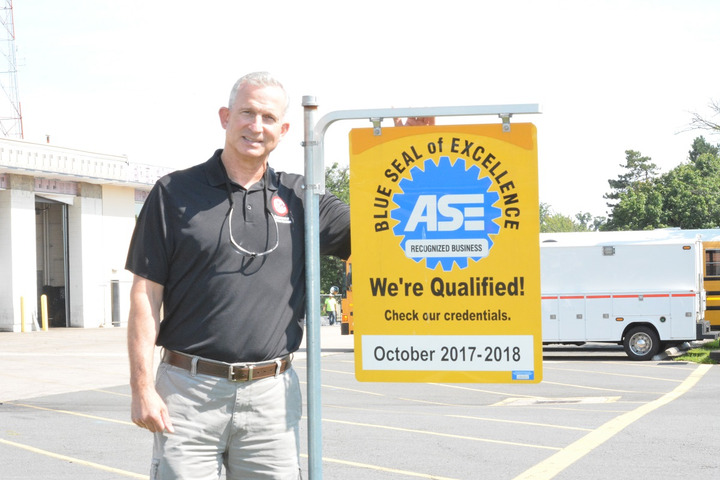 Paul Cupka stands proudly in front of the ASE Blue Seal of Excellence at the Fairfax County facility, which is also currently under construction. Every action always comes back to training for Cupka. “One of my pet peeves is the lack of federal and state funding for vocational training and community colleges. To work on today’s heavy duty equipment, these people need to master highly technical material. The government and states should seriously support trade schools,” he said. However, book learning doesn’t always translate to mastery of any trade. 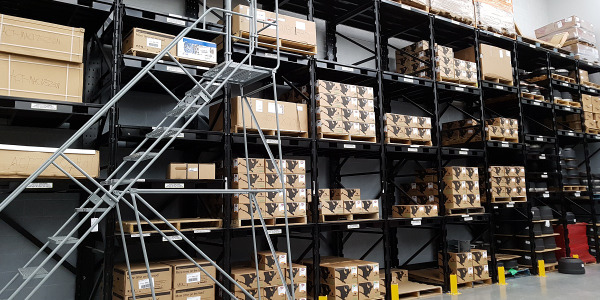 When the current $4 million renovation to the West Ox facility is complete, Cupka said there will be 29 working bays, including a machine shop, parts department, body shop and tire bay. He continues to keep an eye out for sharp technicians and realizes that a happy technician will be a long-term employee. Cupka encouraged his technicians to use their mechanical abilities to build a race car and participate in Fairfax County’s Employee Appreciation Day this past June. The techs enthusiastically built their entry out of 55-gallon plastic barrels, scrap metal and components from the landfill, such as bike wheels. Gravity and luck were on their side, and Cupka’s Crew won the downhill race, beating out three other cars. Janet Howells Tierney is the American Trucking Associations' Technology & Maintenance Council director of council development. 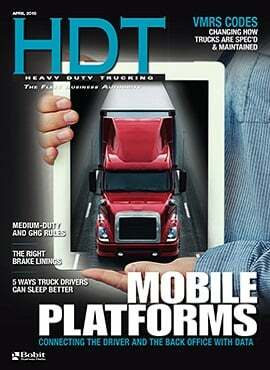 This article originally appeared in TMC's Fleet Maintenance and Technology and was used with permission, edited according to the standards of HDT to provide useful information to our readers.